The Tank Destroyer T28, which was at one time designated as the 105-mm Super-Heavy T95, proceeded no further than the prototype stage after being created in World War II as a thickly armoured tank destroyer for US Army service. The machine was conceived as a breakthrough vehicle to ease the task of puncturing the defences of Germany’s ‘Siegfried Line’, and was also foreseen as a type suitable for service in the planned US invasion of the Japanese home islands in 1945/46. Generally classified as a super-heavy tank, the T28 was re-designated as the 105-mm Gun Motor Carriage T95 in 1945 and then renamed as the Super Heavy Tank T28 in 1946. Another task for which the T28 (or T95) was designed was the defeat of very thickly armoured German heavy tanks such as the Tiger II armed with an 88-mm (3.465-in) gun and its Jagdtiger tank destroyer counterpart with a 128-mm (5.04-in) gun. The T28 was conceived by the Pacific Car and Foundry Company in the spring of 1945, but this meant that the type was altogether too late for service use in World War II. The first plan was to build five prototype vehicles, paving the way to an initial production run of 25 vehicles. The type did not have a rotating turret, but instead carried its 105-mm (4.13-in) main gun in a fixed casemate mount which limited the gun’s elevation arc from +19.5° to -5°, and traverse arc from 10° right to 11° left of the centreline. As such, the T28 was more a tank destroyer than a conventional tank, and this was reflected in its redesignation as the Gun Motor Carriage T95 in 1945, but then in June 1946 a further redesignation made the vehicle the Super Heavy Tank T28. Whatever its designation, the vehicle was in reality super-heavy tank destroyer along the lines of one of Germany’s Jagdpanzer dedicated tank destroyers, and was intended to take on and destroy German heavy tanks as well as driving gaps through defensive lines. 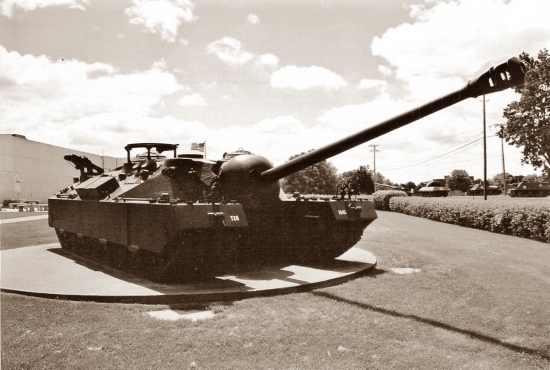 Two T28 prototypes were built, and these were evaluated at the Aberdeen Proving Grounds and the Fort Knox facilities until 1947. In 1947 one of the prototypes was severely damaged by an engine fire during trials at Yuma Proving Grounds, and the wreck was broken up and sold for scrap. 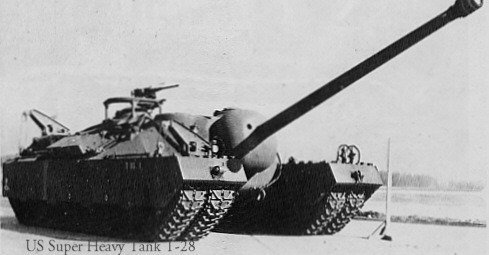 The T28 was never seriously considered for production, largely as a result of the fact that during the later stages of its development and evaluation, the T28 was overtaken both technically and tactically by two new turreted heavy rank prototypes, namely the T29 with the same gun as the T28 in a conventional rotating turret, and the T30 with a 155-mm (6.1-in) gun and more powerful engine. The T28/T95 programme was therefore ended in October 1947. In 1974 one of the prototypes was discovered abandoned at Fort Belvoir, Virginia. The 27-year gap in its history remains unexplained, but the vehicle has now become a museum exhibit. Designed and manufactured by the Pacific Car and Foundry Company, the eight-man T28/T95 had a mechanical system which used parts from the T23, and the laden weight was to have been in the order of 209,000 lb (94800 kg). To support so great a mass, the vehicle was carried by four rather than two tracks, each of which was 12.9 ins (328 mm) wide; to facilitate transport, the outer tracks could be detached, which narrowed the vehicle by more than 2 ft 3 in (0.69 m). After removal, the outer tacks could be attached to each other to create a side-by-side unit which could be towed behind the tank. As a result of its poor power/weight ratio of only 5.27 hp/tonne, the T28/T95 possessed only very limited obstacle-crossing ability and could not use any of the portable bridges then in service, and this was one of the primary reasons why it was found unsuitable for service. 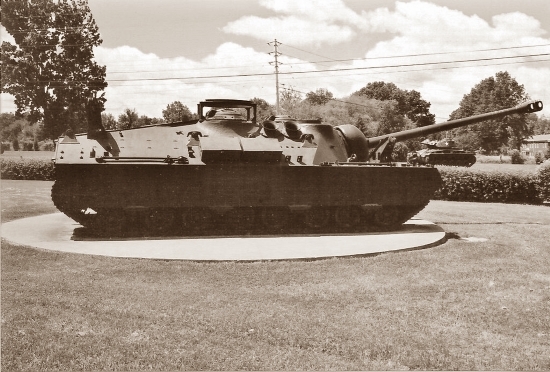 In place of the standard tank combination of upper hull and turret, the T28/T95 had a huge cast carapace to create a casemate type of hull instead, which gave the vehicle a comparatively low silhouette. The main armament was the 105-mm (4.13-in) T5E1 gun, for which 62 rounds of ammunition were provided. This gun was carried in a ball-shaped gun mantlet set into the front of the hull front. When the vehicle was travelling, the gun was locked at its maximum elevation angle. The main gun had a muzzle velocity of 3,700 ft (1128 m) per second, and the maximum range of its projectile was in the order of 21,000 yards (19200 m). The secondary armament was one 0.5 in (12.7-mm) Browning M2 heavy machine gun mounted on the commander’s hatch to provide local protection; 660 rounds were provided for this machine gun. By comparison with that of other tanks of its period, the armour of the T28/T92 was notably thick, to a maximum of 12 in (305 mm) on its front to defeat the projectile of the German 88-mm (3.465-in) anti-tank gun, which in its PaK 43/41 form weighed 16 lb 1 oz (7.3 kg) and had a maximum penetration of 8.9in (226 mm) at 545 yards (500 m) after leaving the muzzle at 3,708 ft (1130 m) per second. The front of the lower hull had 5.25 in (130 mm) of armour and the sides 2.5 in (64 mm), and the suspension system and lower hull were protected by 4-in (102-mm) steel skirts. The powerplant was based on one Ford GAF V-8 petrol engine delivering 500 hp (373 kW), which left the vehicle underpowered with a top speed of only about 8 mph (13 km/h). Range was in the order of 100 miles (160 m). The vehicle’s dimensions included a length of 36 ft 4 in (10.57 m), width of 14 ft 5 in (4.29 m) with both sets of tracks, and height of 9 ft 4 in (2.83 m).